For a chance to win a Baby Baggu, a Baggu X3, a Big Baggu, and one each of the S M L XL zips from Baggu, leave a comment by midnight on Dec 20th (PST) ~ sharing what you’d stash in your baggus! I would definitely stash all of my little gadgets like my GPS, iPod + the chargers and batteries in one of the smaller Baggus! I’d probably carry lunches and my art supplies, those are the two things I need every day. I’d put all my drum books in them! 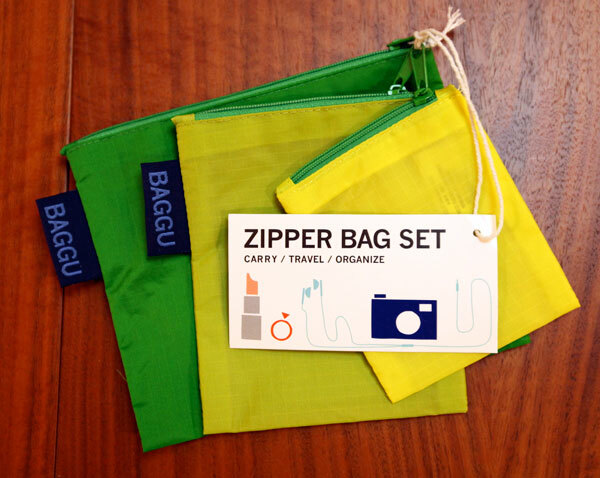 Love the Baggu… will use them for groceries mostly. Yarn… its winter in New England and I’m planning on hibernating. They would be awesome to travel with come summer. I would put all of the fabulous things I got for Christmas! Need somewhere to put the 12 drummers drumming, 11 pipers piping, 10 lords-a-leaping, 9 ladies dancing, 8 maids-a-milking, 7 Swans-a-swimming, 6 geese-a-laying, 5 gold rings, 4 Colly Birds, 3 French Hens, 2 Turtle Doves, and of course the Partridge in the pear tree! Where else am I going to put all of that? In the largest Baggu, I would store one of the other Baggu. And in the smallest Baggu, I would keep my favorite Matryoshka doll! 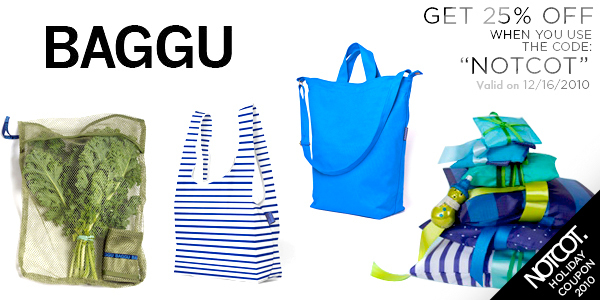 wow…i love Baggu’s! I would stash my jewelry when i travel, organize my art supplies, bills, stationary..oh the possibilities are endless! Since I don’t wear makeup, I’d use the bags for all the papers and id’s I have thrown into my backpack. And also, as a future traveling bag, and everything else. It would store my whole life! Books, books, books, small ones, large ones, thick ones, thin ones. Stop them getting dog-eared while on the m,ove. i’d put in all of that! These are a backpacking traveler’s dream. I’d fill them with travel sundries like hand sanitizer, clothes lines, spare camera batteries, Chinese phrasebooks, and dirty laundry. I’d use one on each present im giving to my friends that travel a lot, a great bonus addition to the gift and would save some trees and pollution. Ohmygoodness these are so cute! I would stash everything in them! One for makeup, one for coins, one for meds, one for tampons, one for reciepts, ect… I would be so much more organized!!!! I would store all of the Christmas presents I have to take to my family across the country in the big Baggu!! I already have the baggu backpack and it’s the best! I would definitely use these for my grocery and farm stand trips, and maybe the little ones for my necklaces; they always get tangled in my purse! Mostly, I would show them off! tiny lil things to craft, make and play with! ooo or snacks! I’d keep one in my purse for random shopping I may do. Otherwise these would be great when traveling to separate up camera/phone/whatever chargers and say, underwear. I am getting ready to travel internationally for my wedding. I could sooo use these bags! From everything to makeup to wedding shoes to jewelry, to undergarments, to some of our small cameras.Not to mention use it for some of those super important 3oz things i need in my carryon. Then once we get there we will have to go grocery shopping and how awesome that it can double for that? !these bags are awesome! I would totally use these bags for my music gigs. Keep my spare reeds. Keep loose sheet music and stands. i would stash everything i have to carry back and forth on the bus, groceries, stuff for work, gym clothes. I would either wrap my presents in one of these or put my favorite colorful pens in them. Or I’d put my snacks in it and put it in my backpack… I love packages! bracelets and toiletries. actually a little one is perfect for holding a couple of vitamins on the go. I’d stash everything and anything. I’d definitely hide some food, probably chocolate, maybe a flapjack, then I’d forget about it and unexpectedly find it one day. Love it when that happens. I also tend to drag around a selection of cameras, I think they would be good enclosed in these. Ready to shoot. I’d organize my room, my bag, my life! My friend just staged an intervention for my disaster-zone of a living space. And my constant searching for items in my cavernous bags. The baggus would help me get a start on living a more orderly life. Hopefully. Hmm.. definitely all those loose items that need collecting.. cables, small bits and extensions for my random electronic toys. Chargers and the like. I would stash books and cds and scarves and pens and pencils in my baggu’s. Oh, and groceries of course. What a perfect giveaway for me ^_^. I really love to stack everything in small pouch. From baby diapers to make-up kit. Everything has their own pouch. 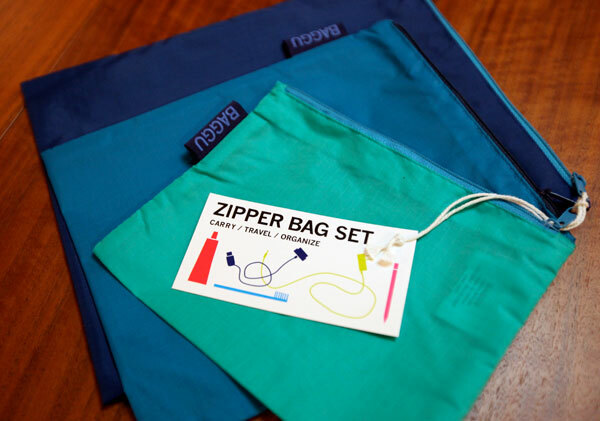 And these bags from Baggu makes me drooling..Love it! Books and pens and pencils. They are all over the place. Those are awesome! I would probably store makeup, crayons and random trinkets in them. For travel! Pacifiers, loose change, index cards, colored pencils, diapers, and View-Master slides. In that order. I would put groceries in them, my laptop in them, pens in them, and my cat. These would be great for organizing my suitcase for my next big trip. these would be awesome grocery bags, i’ll be looking fly walking down the st with these. I WANT!!! I WANT!!! I WANT!!! Ohmigosh I love these. I am constantly changing work bags and moving treasures that I carry with me all the time from interior bag to bag. Makeup and among other secret objects HAHA! i’d carry my mini midi controllers. Great products for slightly OCD peope like me. I’d use these in my backpack for work to organize my work stuff. Like electronics, chargers, extra clothes like socks. I’d also use then in my bike bag (trunk) when I bike commute to work. Hmmm, I’d stash your lovely Christmas gifts in the fabu baggu’s, so you couldn’t see the outrageously hip, flocked wrapping and recycled vintage velvet bows surrounding your high tech, high design gifts. 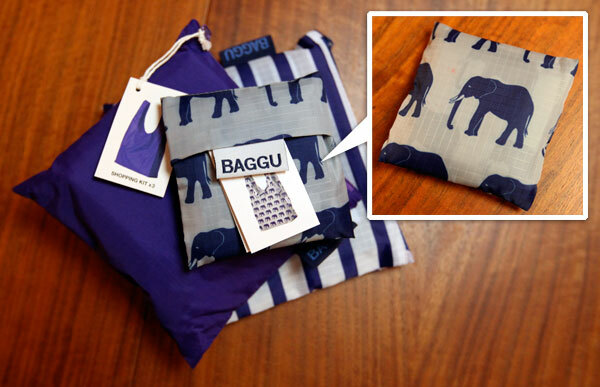 Oh dear, we’ll never be able to find your gifts if they are not bagged in these beautiful Baggu’s! I would prob keep the small one and put change in there and leave it in my car. I’d get my sewing stash organised. I would be able to separate my buttons, ribbons and other bits and bobs so I could lay my hands on things more easily when I’m in a crafting mood! Book and yarn project to carry everywhere. I’d stash my kindle and other electronics for travel! i’d stash all my art supplies in them like artlines, pencils, color pencils, etc. and bring a different one every other week to school!! I’d use them as gift wrap. I would use them to store all my random camera accessories! Travel gear, and in special my lomography-stuff.. So camera, flash, lenses and film-roll etc. Wow, super cute! I don’t even have these in my country. I don’t go grocery shopping, but I do go clothes shopping, so I would LOVE to have these to carry around town looking super fashionable. I’d fill my baggu with anything from coins to clothes and books. I like my stuff being organized even if i’m travelling. Those could be a solution for keeping everything where they should be in the backpack. Love the style and colors! I’d sue for my makeup and another for my pens and catch-alls. i’d stash my flipflops in one, my make up in another, a pair of shades in one… etc etc. maybe some snacks too. I’ll use it to store my markers, pens and sketchbook! Travelling around will be so much easier. shoes, make up, hairstyle, laundry, hi-tech stuff, documents, money, pens, paper, jewlery..
What wouldn’t I store? My life would be stored in these bags! My beloved DS and wallet and other random things, I’m sure. Makeup and sewing projects, for sure. I’m sure other random things would get mixed in too. Probably put the loose items in my backpack in there. My groceries and library books! i just moved into a new apartment and i have all sorts of random trinkets and art supplies to organize! I’d put my cat in the big bag & carry it around the house. SO CUTE. I would use this to harness my craft supplies! They would be amazingly useful for our trips to the farmers market. Why, more bags! Or, more likely, a bunch of little stuff that I want to keep together. I have never seen such adorable bags they are so BRIGHT! I would store everything in my Baggu! I like to keep my room in order and neat. People call me OCD in that way but I like things to be in their correct place! I would put my clothes in the baggu especially when i am traveling or spending the weekend at my sisters. I would use them to hold my school supplies because I dont have a backpack I have become fond of. My purse is too bulky but I like to carry around certain items such as chapstick, a small hairbrush, a toothbrush, toothpaste, floss and other items such as those. Many times I have found those items useful at odd times. Being organized is easy especially when a color coordinated look is completely me! I would LOVE the Baggu and they would definitely get great use from me! A certain type of plant matter! As I live in Toronto, I would use the Baggus for shopping! Other than that I would use them to carry my everyday makeup and personal items of need. I would be so organized! I’ll use this for everything!! My new camera!! And all my groceries from Trader Joes. I’d probably mostly store clothes that are unseasonal! What I would keep in them? This is a give away made for me! Organization freak that I am! As an university student living away from home, I often travel back home to my parents’ house and because I am a girl I bring with me so many beauty products and make up and accessories with me! I use plastic bags to put everything in. But with BAGGUS I would have a little bag for everything and I would find it in an instant thanks to the different colors! Including a protective case for my camera and chargers for every electronic device I carry with me. I also would be be able to go grocery shopping and deny those horrible plastic bags, while flashing my fashionable BAGGUS around the neighbourhood! Or just shopping anywhere in general Looking good and helping the environment! The better question would be, What wouldn’t I keep in my BAGGUS? I would have a perfect BAGGU for everything! I’d put my rabbit in it. Her name is Toffee. What wouldn’t I use these bags for? I would use the Baggus for shopping and the zipped ones for packing! It would make it so much easier and neater in my rollaway bag. i’m going to korea on the 24th with my friends and these would be PERFECT for organizing luggage and for carrying anything we’d be buying while there. I love making washi dolls, like shiori ningyo and other origami related projects so I would store some of my supplies in these bags. all the essentials i need to take a trip and get some rest! All my random wires that are laying about. And maybe one of my cats. They love bags. All the things for various craft projects, in easy travel size! Groceries. Recent purchases. Lunch. clothes! and shoes.. they are always so useful when you need to pack everything in a suitcase! Delicious groceries, the results of my next shopping spree, laundry or toiletries while traveling… anything, really! My wife would love these. I am sure they’d be filled with knitting stuff or art stuff or a multitude of other things she is keeping in ziploc bags. I’d use some for groceries, one as a lunch bag, and the rest for travel toiletries. I´ll use it to join my cool collection of travel goods, to store any kind of stuff for my trips, from fragrances and creams, to headphones, condoms and underwear! I would use them for groceries which is mainly just yogurt and cookies! I rely on public transportation and so when I leave the house, I never know what I’m going to have to pick up (and carry with me) when I’m out that day. These would be perfect to have when I end up making spontaneous grocery store/pharmacy runs! I will use the Baggus to store a range of items. From clean and dirty clothes for gym, groceries, my packed lunch for work to books to drop off at the library! The zips will come in handy to separate my belongings in my huge bag! One to store my moleskine and pens, one for make up, one for my ipod. The larger ones will be great to store an extra change of shirts and other misc stuff when I go overseas! iphone, make-up, pens, ideas, trein tickets and goodluck charms. I’d store my makeup, lens filters, extra rechargable batteries with the charger and laptop accessories in the bags. I would stash all the christmas presents in them! Then on to friend and giving all the lovely things wraped in festive wraping paper. These would make my bag mighty organized - and so useful when traveling! id put these baggus in the baggus i just bought with the coupon! thanks. been waiting for it to become valid. awesome contest! I’d use the zip ones for travel - to hold all my chargers, ipod, headset, usb sticks etc! i used my cupon !! I would stash my creativity in one, my ingenuity in the other & my inspiration in the rest. Gotta save some up for the future! i’d stash my make up in the small ones.. and i’d have my packed lunch for work in the bigger ones! I would use these for my backpacking trips of course! i would definitely LOVE these! been looking for a clean, simple bag to keep things in! and i would use them to carry my electronics in so they dont get scratched up/damaged while they’re rolling around in my bag. I’d store a million groceries in these! They’re adorable. I’D stash my groceries, my make-up, pens, earbuds and pens floating around in my purse. I keep baggu bags in my car glove box, and I use them ALL the time. You will be shocked how many times you reach for them, when you have them handy. SO I would use them for all the little random things I already do. i’d stash my moleskin sketchbook,mini pencil,driod phone,earphones and gum. basically my urban sketchcrawling kit! 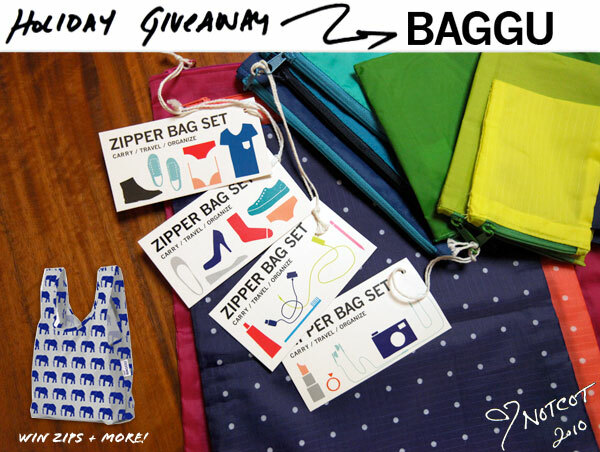 Baggu is great … this is a great giveaway! Oh I’m so much in need of these for shopping from the bulk bins. I’d love to win these so I don’t have to make my own produce bags! I’d stash extra clothes for the girls, beach items for the beach, groceries from the store, and many other things. Groceries, yoga clothes, puppy toys and pretty much everything! Yarn yarn yarn yarn groceries and yarn! Last year on my wish list I wished to be able to win the Baggu bags given away by Notcot but all I got was a book about eating this and not that. I didn’t understand why as I have been good all year round until I realized that I had forgotten to place cookies for you. So this year, my wish is the same but this time I will place a mountain of chocolate chip cookies with a glass of cold milk next to the Christmas tree. I have been good this year, you can check The List to confirm. And as an added bonus, if I win, I will share a Baggu with you so you can carry more presents around on your sleigh. P.S. Tell Rudolph I said hi! I use them for grocery shopping and for travelling. They’re so handy! I’d use them for school stuff! books, art supplies, cameras, and tobacco! Use all the zip ones for when I travel. Storing makeup, toiletry, dirty clothes, etc in them. Use the others to haul my buys home. I’m going backpacking, so I’d probably store some food or toiletries I’d need in them! I’d stuff it full of gingerbread cupcakes and mini-pies for all the hoilday parties I’m going to! Isn’t it funny that we put bags in other bags? I would stash bags in other bags. I’d put my shoes in the big zipper bags, carry my lunch in the Baby bag, and haul my farmer’s market veggie home in the regular Baggus. these bags are so cute! I would stash my notebooks and felt tipped pens in them. I will keep my baggus in each other! Most efficient! any and everything! staritng with groceries, smaller ones would be good for on had cat treats for training, and for containing the stuff floating around in my purse and in my luggage when I travel. Definitely electronics. Toiletries and random junk. Stuff from the farmers’ market. I’ve loved my baggu bags for years! One of the first things I ever saw on Notcot, too. Smaller ones would be wonderful for taking lunch to work, as I feel a little silly now carrying a sandwich and a book in a bag large enough to fit two or three bags worth of groceries into. i’d stash my wine & snacks for the beach concerts in my baggus. and they will be the perfect accessory for my bike basket!! my moleskin and my markers, so I can sketch whenever I feel like it. I would store all of the stuff I’m going to have to pull out of my bag again to be put through the scanners at the airport. It is crazy how simple these are and how fabulous they look. i would use them for everything esp. to organize my giant handbag. Why, my pocket elephant, of course. awesome! groceries in the big ones! Oh. My. Goodness. I just love Baggu, so much that my fiance thinks I’m crazy. I would use these bags for stashing travel goods in my car for road trips, on grocery shopping trips, carrying gym clothes, toiletries… heck, pretty sure I would use the bag as an oversized purse! LOVE Baggu! I’ve been getting back into mock ups and crafting more lately in my design. I could def. use this to store some of the tools and the new design books I’ve been buying. The question is what wouldnt I be able to put in my baggu!? Simple yet colorful and practical, they are bags that would allow a college student such as myself to carry anything from make up, clothes, groceries, etc. hassle free! That elephant Baggu is the coolest reusable bag I’ve ever seen. Not particularly glam, but I’ll use it for schlepping my groceries home in style. I’d have to get a bunch of hamsters, because nothing’s more fun than some bags full of hamsters. With this, I’d have enough bags to stash everything! I love baggu!! Personal goods for my upcoming vacation to Vienna! I’d finally have a place to store my cape and the rest of my spandex superhero costume so it doesn’t get lost in the bottom of my big bag. Metropolis will be safe again! … travel, camera, lens, phone, keys, usb-key, candy, wallet, coins, groceries, passport, pencils, e-v-e-r-y-t-h-i-n-g……. I’d stash my coin collection from Vietnam! I would stash EVERYTHING—I would keep these in my purse all the time and stop using disposable bags entirely! i’d use my baggus to carry all the little essentials i need to take with me on my up and coming move to Beijing, China! my camera, my art supplies and little gifts i’ll be taking for new friends! I would stash all of my paint and brushes in one of those beautiful bags. i could definitely use these awesome little bagguses on my upcoming move to China! some paper bags for holding my groceries. Just messin, I guess it depends on the size. Ummm. What would I NOT store in there. Big trip coming up an these would really be great! What lovely and useful baaaaaags. I can’t live without bags and pockets, all floating in my handbag or rucksack…it’s a fantastic idea, expecially the shape and colours, so I’d recognize what’s in each one!!!! I looove them, I’m just imagining all my stuff, makeup, notes, organizer, paintbrushes, watercolors, sketches, everything in the right place, whooah!!! All of my CSA veggies! everything has a place. my bags are filled with bags within bags so these would be perfect! I would totally love to take these traveling with me! They look like awesomeeeeeeeeeee to stash some makeup and other traveling accessories in! Groceries and peanut butter and beeru. What would I stash in my BAGGU? My life. seriously. everything. they would help organize my life, in a beautiful and fun way! I would stash paint brushes and other art supplies in these! They’re colorful, artsy, and brushes would dry so easily.. I love it! I would most likely stash groceries and other goodies in this bag. Although it would make a stylish book bag as well. Oh, who am I kidding. The possibilities are endless. Laundry change in one, and travel medicines in another, and doggie treats in another. So there. Crochet hooks, fishnets, and a small elephant. produce for sure! away with those little plastic produce bags! Groceries and stacks of library books - I’m a junkie! Aww… I really like the elephant print and polka dots. I’d use the big baggus for groceries and the little ones would be really handy for keeping my suitcase organized. ooh! I would stash either my bathing suit for some beach time or extra clothes after yoga. what’s inside my Baggus if i win it? a polaroid camera, my moleskine, a Holga, some rolls, and a few mints. What a great, stylish way to keep organized! Being a designer and traveling all the time for business, a set of these bad boys would be top notch! From cords, camera and hard drives, to swatch books, mock up samples and even the beauty products that tag along with every lady; truly a practical gift for the creative! Goodness, in my Baggu’s I’ll be stuffing just about anything that will fit that I may need to take with me on any given day. Work stuff, lunch stuff, groceries you name it…..
Pens and Pencils! Or I could have a separate one for each….Squeal! I have one baggu, and I carry everything in it! It’s my book bag, it’s my grocery bag, it’s my travel bag, it’s my athletics bag…the possibilities are endless! This is awesome.. i love bags (Lord knows i’ve got tons of them lying around my room)… I’d stash snacks, pens, bobby pins and other hair accessories, phone/wallet/keys (for easy purse organization), groceries.. and my secret stash of sweets. Groceries, groceries and more groceries! Today, I’d stash a fake moustache, some breath strips, a few multivitamins and a deck of cards. Tomorrow - who knows? I would use the big ones for my groceries and stash medicine/ cosmetics in the smaller ones! I’ll stash travel things. Shaving accessories, toothpaste, camera stuff, etc. Oh, so many things! I have a collection of movie tickets dying to move to a Baby Baggu! my wife and i are wedding photogs and travel A LOT. this would help with organizing equipment and clothes. I’d stash either my feel good medicine or my feel good tools of trade Art stuff…. and maybe some of my computer nick nacks….I have alot of that stuff laying around and can use a good clean up! Ohhh I would definitely use them to help me stay a little more organized everywhere. Random bobby pins and clips, makeup, paper clips. Might even use the big baggu to carry things for class. I have all sorts of little nick-nacks floating around in my bag that the Baggus would totally wrangle. I would pack gear for my dream trip to Antartica. Farmer’s Market finds! Crafting supplies! Stuffed animals and imaginary friends! Currently my giant purse/tote is one giant hole where anything get lost once I put them in it. I’d use the bags to keep everything organized so I’m not hunting for my phone every ten minutes. I would stash all my travel stuff in them! They would make packing for trips so much easier! 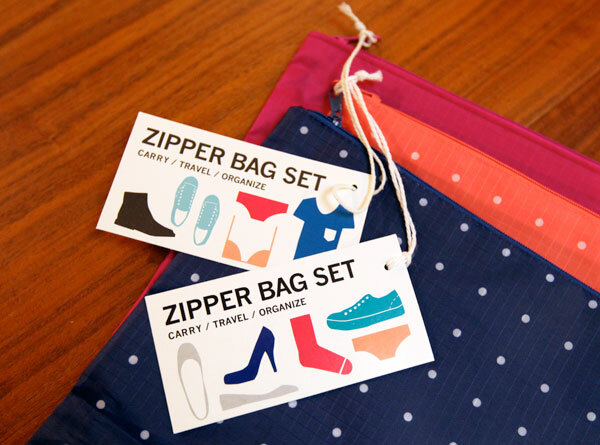 I will definitely use the zippered bags to organize my toiletry travel bags. I travel a lot and they are a mess and need some organization! Hm, I think I would use them for make up. It would also be great to use one as a smaller bag inside a big one that has no inside pockets. (that sentence was a bit weird, but oh well, I hope it makes sense. I would use them for traveling to keep items in my suitcases in order. I love love love baggu bags! I love them to grocery shop the most… I also use a baggu bag as my lunch bag! i carry a baggu with me at all times! you can never have too many. they’re great for biking to the grocery store. i’d carry around my knitting if i had another. All of the stuff (arduinos, servos, GPS units, batteries, etc.) that our engineers use to build robots…I couldn’t tell you what all of it is, but it’s really starting to take over our office. Love badges using them while I travel around southeast Asia now! I already use a couple bright green baggus for grocery shopping; more baggus means I can carry home more wine! I’d use these for groceries, makeup, and maybe even some knitting projects; I really am that cool. What a cool giveaway! I’d never use another eco-hostile plastic grocery bag again, and my cords would stop entangling and mating in my travel bag. They are gorgeous! I’d put my kittens in the large one to take them to the vet! I’d probably stash my stuff for Spin class in it. Oh…The bag colors just make me HAPPY! I would use one to carry the assorted mosaic tiles that always end up in my purse (I love to show folks what I use to create my art!) and I’d use another to store the special little notes and drawings that my little kids leave me. Definitely for packing underwear - hopefully it would end the wasted time spent rummaging for that odd sock, and/or reduce any potential for an embarrassing incident involving stray knickers…. I would use them for groceries and to help organize some of the random items I have floating around my backpack. Holy moly…I’m just starstruck by their awesome colors. Possible organization tools for my crazy teacher supplies? Wow - love them. I’d definitely use the zipper bag for my make up to put in my big bag. Would be perfect!